I'm back today with the last of the Frozen projects. 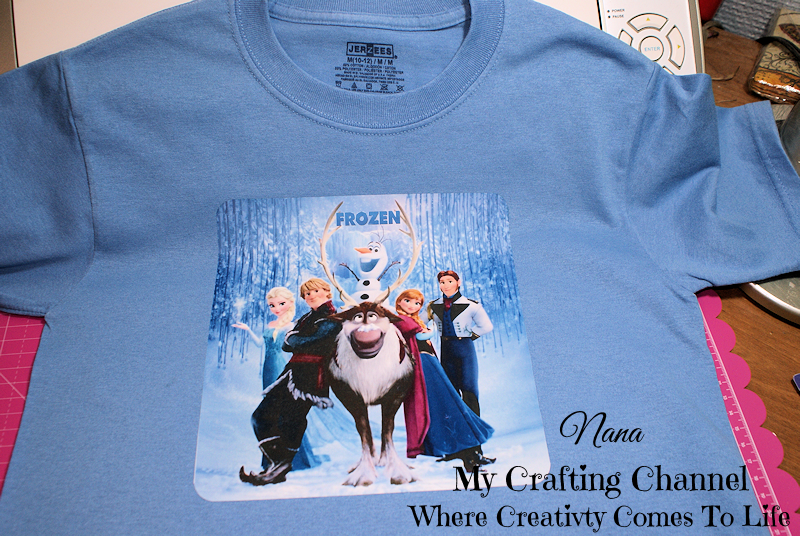 A T-shirt with the main Frozen characters. I was amazed to find that I had a blue shirt in the right size and perfect color in my stash. Oh wow, amazing shirt! My little Granddaughter, Arya is so into Frozen right now! I should try and tackle a t-shirt for her! Awesome job on this Nana! Will be back after vaca to catch up on missed projects! Have a great week my friend! Oh my goodness, this is fabulous! Love this movie and this is such a great scene of all the major characters. Great work with all your Frozen projects, I've enjoyed seeing them! This turned out amazing! I love the frosty blue and how clear the image came out! UMMMMM...this is BETTER than @ the Disney Store!!!! With 3 girls, I need directions/video of how to do this! LOVE it! OMG!! This is just DARLING!!! I agree with what Claire said BETTER than @ the Disney Store!!! This is such a great project !!! Thank you so much for joining us at Craftin' Desert Divas ! !